Already in the first week of March the truce had come so far that the opponent started to construct new roadblocks and reinforcements in the demilitarised zone. These violations of the agreement continued in the future. Bridges were broken down or mined, roads blocked railroads over great distances broken up. After a protest this kind of work continued only during the night. The opponent used the truce to make a band around Semarang in which no one lived and at every opportunity benefit as much as possible to make the ending as much more effective as possible. Air bombs and mines were placed at different points all the time. From our site these activities were followed with the greatest interest. It was prohibited to make recognisance from the air over the republican area, which made it difficult to be up to date with what was going on. And we cannot praise the people in the intelligence service enough. They knew the terrain around Semarang in and out as their own pocket. 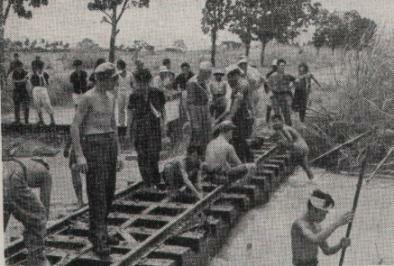 Building of a bridge at Semarang in cooperation between the Dutch Army and T.R.I. Of course all the traffic to Semarang was cut off. At first it was only smugglers who came through to the town. But after the 2 kilometres zone was completely evacuated it was also spies who came into town under the name of smugglers. The Polisi Tentara was not accurate in trying to stop these offenders. First the Japanese then this! This way the economic situation in Semarang stayed the same way after the truce as before. Eggs still cost one guilders or more, fresh fruit, fresh vegetables were nowhere to get and sugar scarce. For short everyone lived of whatever come through distribution. In this way it was only the opponent who had an advance out of this “cease-fire”. Without being disturbed he could prepare his positions and prepare for the attack on the defence. The demarcation line was not the start on reconciliation but rather completion of separation. The duties were no way made easier because of the slowly way in which the 3-7 R.I., a guard battalion which had arrived in Semarang just before Christmas 1946, was put into the line. As will be known this “third” battalion should get a decisive guard task. It was also the reason for sending them to Semarang. Gombel, the harbour and the airfield were taken over by them. The first in cooperation with the old troops. The field education was not forgotten either and patrols were run in the area of the demarcation line. A knowledge these troops later put to good use during the police actions. 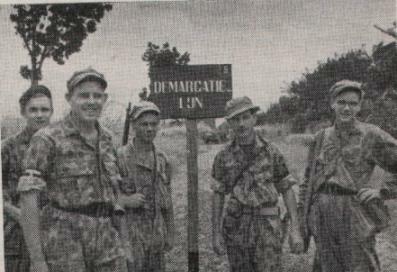 It was the first conscripts who arrived in Semarang. They were a good search for gossip, which is always the case with this kind of soldiers who listen to all the lies. 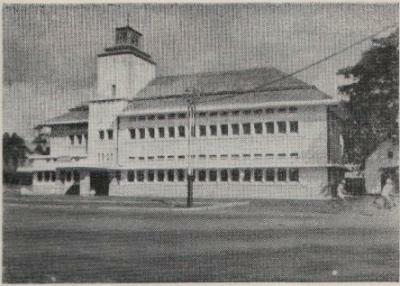 On 9th March it was celebrated in a stately manor that the Tiger Brigade had stayed one year in Semarang. The first day an ambitious parade was held in which every unit participated. 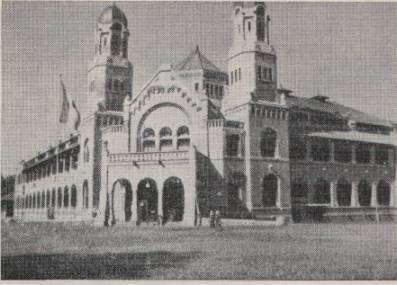 Here drove 2nd Eskadron Pantserwagens a unit, which had arrived in Semarang on 22nd September 1946, Huzaren van Boreel, and OVW’s with the pomp and circumstances of the best time of the cavalry. Because of the circumstances they could not do their work: There was no space for the weapon to make the big breakthrough. However a little job would arise. Together with a company from the 1st R.S. they formed a Storm Afdeling that should play an important role in the operations during the police actions. They opened the parade with the quick vehicles, and then came the battalions in trucks, the support units, and the tanks, which as usual made the end. It was an impressive picture of a mobile army. The highlight was the laying down of wreaths, which also made the official opening of the cemetery at Tillemaplein. On initiative of the Brigade Commander and his second in command lieutenant colonel Kronig was already shortly after the Brigade had started to work as a combat unit. Searched for a place where fallen and dead comrades could find a final resting place. The local graveyard where soldiers could be buried between civilians was not found good enough. The community then offered a place at Tillemaplein such as should be found in elder books. At this day of recognition the Brigade Commander lay down a wreath at this cemetery in the presence of delegations from all units. At that moment there already lay 79 men at this cemetery from the Brigade: This grew during the year! On 10th March sports competition was held, which culminated with a team pursuit from the harbour to the Brigade Headquarter to symbolise the entry into town a year earlier. The winner was 2-13 R.I. the battalion, which had also been the first to land then. Translation Experts Ltd. is pleased to provide this link to the InterTran (tm) multi-language translation system for webpages and text. The translations are not perfect but they can give you a general idea of what is being communicated. Some of the languages have more limited lexicons then others so the quality of translation can vary between the languages. We always suggest that if you need critical translations hire a translators or take the time to learn the language that they want to communicate in. Any text or webpages that are translated will appear within this webpage frame. Some of the languages will need additonal support for specific fonts.